The College of Performing and Visual Arts is home to a dedicated and talented faculty and staff of more than 90 professionals devoted to helping students prepare for careers in the arts. 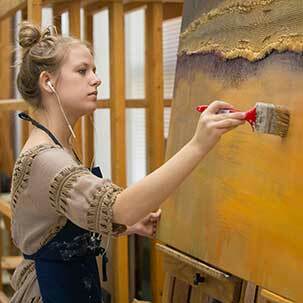 Our current population includes nearly 1300 arts students. The UNC Arts experience combines the best of the time-honored academy traditions and the most current and forward-thinking ideas in the arts with the liberal arts education of a major university. We maintain an annual calendar of more than 300 events in a wide variety of genres. These activities are open to the public and members of surrounding communities are invited to share in the excellent offerings of music, theatre, dance, and visual arts. The School of Art & Design has been a leader in the preparation of distinguished artists and art educators for over 100 years. The rigor and quality of our program is reflected in our NASAD accreditation (National Association of Schools of Art and Design). The diversity of our faculty’s knowledge translates into an enriching and meaningful classroom involvement that incorporates real-world experience preparing our students for successful and rewarding careers in the arts. 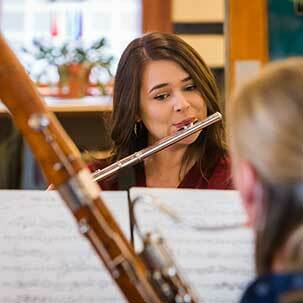 The School of Music is a vibrant and vital community of musical performers, composers, scholars, and educators. With 500 music majors ranging from freshmen to doctoral level, 60 faculty, and 8 staff, the School of Music is actively engaged in creating and learning about music of all styles and genres. Indeed, music faculty and students present hundreds of outstanding recitals, concerts, and special events each year. Named a Colorado Program of Excellence by the Colorado Commission on Higher Education, the School of Theatre Arts & Dance provides pre-professional training for students who plan to pursue careers in professional theatre, or as teachers of theatre arts. The School actively cultivates an appreciation and understanding of theatre as a part of American society and culture, and as a vehicle for the enrichment of life. Meet Armando and other people just like you. Learn about the latest gallery exhibitions and talks, student opportunities and achievements, and faculty and alumni news. Check out our upcoming concerts, events, and festivals. Read about student accomplishments, alumni news, faculty projects, and more. Get a behind-the-scenes look at our theatre productions and read current news about our distinguished faculty and alumni. "BROADWAY TRANSPLANTED TO GREELEY, that is the idea of The Little Theater of the Rockies," said the Greeley Tribune announcing the first season in 1934. The season has five shows and we recommend buying a season subscription, allowing you to see all five shows for the price of four, as well as providing you with other subscriber benefits. We maintain an annual calendar of more than 300 events. These activities are open to the public, and members of surrounding communities are invited to share in the excellent offerings of music, theatre, dance, and visual arts. Sign up for email updates or contact the Performing Arts Box Office for more information at (970) 351-4849. The College of Performing and Visual Arts at UNC gratefully acknowledges UCHealth as our Premier Season Sponsor and the official hospital system of the Arts at UNC. UCHealth’s sponsorship funding goes directly to support our students financially, which in turn helps them to become more successful in their pursuit of artistic distinction.